60 3/16 by 60 1/8 in. 152.9 by 152.7 cm. 72 1/8 by 77 1/8 in. 183.2 by 195.9 cm. 30 panels, each: 16 by 16 in. 40.6 by 40.6 cm. 42 by 42 in. 106.7 by 106.7 cm. 36 by 104 in. 91.4 by 264.2 cm. NEW YORK, September 17, 2014 – Mitchell-Innes & Nash presents an exhibition of paintings by Julian Stanczak focusing on the artist’s evocations of natural phenomena, energy and light. This is the gallery’s first solo exhibition of Stanczak’s work, which includes a dozen large-scale paintings spanning the artist’s career from the 1960s to the present and will include works not seen publically in decades. The exhibition will be on view from October 30 through December 6, 2014. While Stanczak is often associated with the Op Art movement, the artist’s focus has always centered on the complexity of color relationships and their effect on forms and space. The term Op Art first appeared in a 1964 Time Magazine article that sought to contextualize exhibitions such as Stanczak’s first solo show at Martha Jackson Gallery, “Optical Paintings,” which had opened in September of that same year. The several paintings exhibited were the first Stanczak would show in New York, and displayed the artist’s masterful ability to manipulate lines and form through the medium of color. Stanczak’s reverence for color comes from a desire to translate the drama and power of nature into a universal impression. His canvases are created through a complex process of tape masks in which colors are systematically added and unveiled in layers. While incredibly methodical, Stanczak works alone on his canvases without the aid of preliminary sketches, relying solely on his own vision of a finished work. 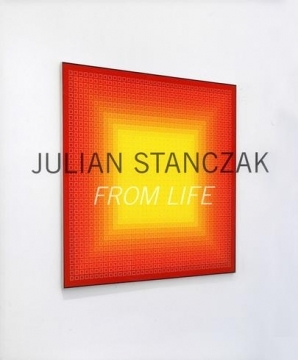 Julian Stanczak’s early life was marked by enormous personal struggle. Born in Poland in 1928, Stanczak and his family were forced into a labor camp in Siberia during World War II, where they survived extreme working conditions and near starvation. Stanczak escaped but was greatly weakened after contracting encephalitis and ultimately lost the full use of his right arm. As a therapeutic practice during his recovery, he taught himself to work solely with his left hand. Not only does he paint with his left hand, he also builds his frames, stretches his canvases, and handles all aspects of his artistic process himself. Stanczak ultimately fled to a Polish refugee camp in Uganda in the late 1940’s where he started to make artwork inspired by the stunning light and atmosphere of Africa: a type of hypnotic chromatism that would later influence works like Referential Circle (1968), which seems to hum internally with a hazy glow. In 1950, Stanczak immigrated to the United States where he studied under Josef Albers at Yale University. 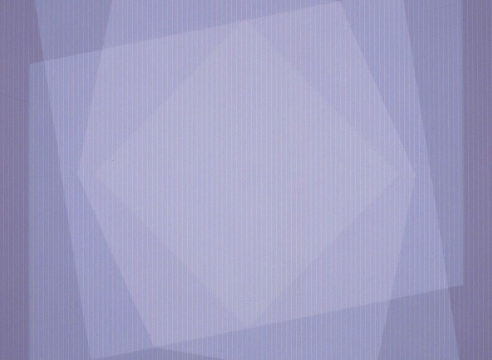 Josef Albers’s teachings on color theory and the precision of geometric forms were fundamental to the development of Stanczak’s mature style and method. From Albers, Stanczak learned the complexities of color and the importance of precise yet seemingly effortless painting. Fueled by his own personal history of shifting geography, the perceptual effect of one of Stanczak’s paintings can range from the most subtle, vibrating glow of works like Additional (1980) to an electrical, rhythmic oscillation like Spinning Away (1971). Using filmic screens of color, wavering lines and geometric forms of varying opacity, Stanczak creates a palimpsest of visual energies for an art both organic and absolute. The exhibition will be accompanied by a fully illustrated catalogue, published by Mitchell-Innes & Nash, with an essay by Dr. Eileen Costello. Dr. Costello has previously published essays on Brice Marden, Allan D’Arcangelo, Jackson Pollock, Tony Smith and is a contributing author to the forthcoming Jasper Johns drawings raisonné. Cleveland Institute of Art, Ohio, 2001; and most recently Line Color Illusion: 40 Years of Collecting Julian Stanczak, Akron Art Museum, Ohio, 2013. His work is included in notable collections such as Albright Knox Art Gallery, Buffalo; the Carnegie Institute, Pittsburgh; the Hirshhorn Museum, Washington, DC; Museum of Modern Art, New York; National Gallery, Washington, DC; and San Francisco Museum of Modern Art. Mitchell-Innes & Nash’s renowned exhibition program, in both their Madison Avenue and Chelsea locations, fosters excellence within artistic practice, while forging an informed dialogue between emerging and established internationally recognized artists. From acclaimed surveys of 20th century masters, such as Jean Arp, Anthony Caro, Jay DeFeo, Willem de Kooning, Leon Kossoff, Kenneth Noland, Roy Lichtenstein, and Nicolas de Stael, to solo exhibitions of Sarah Braman, Keltie Ferris, Daniel Lefcourt, William Pope.L, Virginia Overton, Martha Rosler, and Jessica Stockholder, Mitchell- Innes & Nash has proven expertise in both advancing the careers of emerging artists and maintaining the superior standard set by established artists.